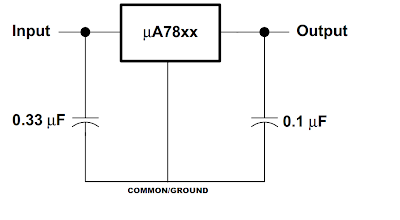 7805 is the most famous and common voltage regulator which belongs to the family of 78xx series (Other commonly used members of the Family are 7805,7806,7808,7810,7812,7815, 7818, 7824). And in case that you haven't provided the Minimum Input Voltage, it is not true that it will not work but the output voltage will be reduce. The 1st pin from the left is the input pin, 2nd or the middle pin is the common (COM) or ground (GND) & the 3rd pin is the output pin. So for a 7805 who will generate 5 volts you need a source which generates at least 7 volts (7.3 to be more precise) & can be fed as input to 7805. As you can see in the figure below positive of the battery source is connected to the input pin of 7805 & the output or the third pin is connected to the positive of the diode via a resistor and the ground pin is common for both. An amazing thing about 7805 is that if you need -5 volts from this IC (7805) all you need to do is to interchange output and the ground pins across the load. Just like you do in a battery. In the circuit below we will need the resistor R1 to be connected across the LED in series, other wise there will be high chances that will will blow off your LED. At many places(books/websites) you would have seen these kind of images (given just Below) and wondered what it is? It is the same thing as was shown in the above circuit diagram, the only difference is the capacitors and these are only to reduce the ripples if any are present since not every voltage source will hold a constant amplitude. You might have thought can 78xx IC act as a variable voltage regulator, yes 78xx series can also act as a variable voltage regulator where the voltage at the output can be varied depending on the requirements of the circuit, by just varying the value of one of the resistor in the circuit. By using this formula(given Below) you can find the value of output voltage. Thus, by varying the value of R2 the output voltage can be affected. And the above circuit will act as a variable voltage regulator. # 78xx series ICs do not require additional component to provide a constant, regulated source of power, and are really easy to use. 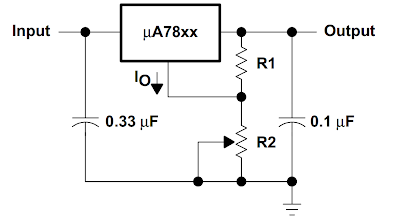 # 78xx series ICs have built-in protection against a circuit drawing too much power. # They have protection against overheating and short-circuits. # In some cases, the current-limiting features of the 78xx devices can provide protection not only for the 78xx itself, but also for other parts of the circuit. 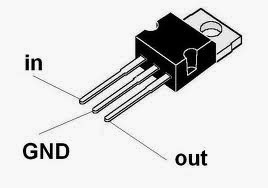 # These types of voltage regulator dissipates a lot of heat therefore a heat sink is suggested in case you are working with higher voltage like 20 volts or so but even with 12 volts of input they generate decent amount of heat.